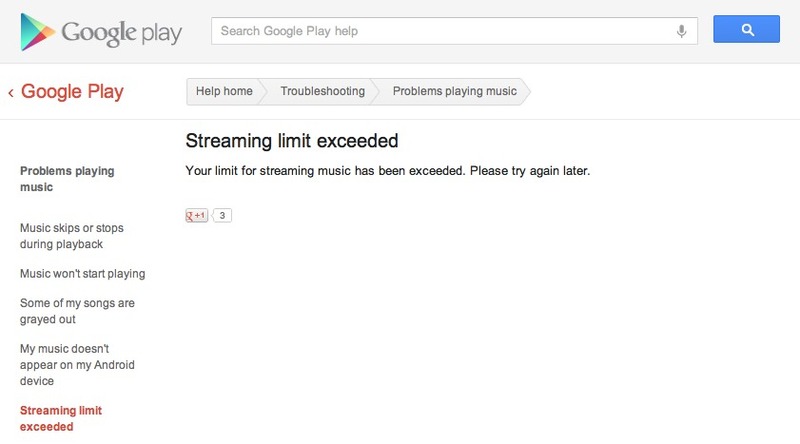 One of our readers, who has converted his entire musical life to Google Music, was prompted with a “streaming limit exceeded” message yesterday. This is the first we have heard of any sort of streaming limit, and in fact, Googling for it leaves us to believe that this issue is fairly uncommon. But with the support page for it leaving out all details, we have pinged Google to see if we can get some further clarification on how a user could reach such a limit. And from what we can tell, this has nothing to do with the 20,000 song limit that Google Music accounts have. This is about streaming that music, reaching some sort of data or time cap and then being told to “try again later.” Again, since cases of this happening seem to be low, we can’t imagine that the limit is low enough that any of you will ever see it. Update: We have been told that there is a daily streaming limit, but that it has been set so high that the majority of users will likely never hit it. Explains why we couldn’t find very many cases of this happening when doing a few searches. Not sure there is a need to worry at this time.